Choose from our cabin tents that feature a covered veranda area with a built in table where you can sit an enjoy the view of our camp and river. 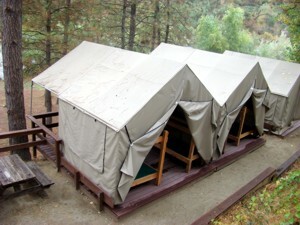 Inside each cabin tent are bunk beds with a comfortable thick foam pad. You will need to bring your own sleeping bag and pillow or you can bring blankets and linens to make your own real bed. All of the tents (except the large group tents) have one double wide bunk bed in each tent. 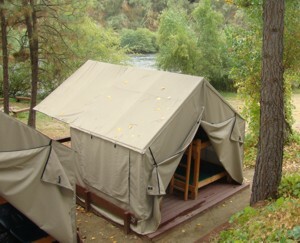 Our regular cabin tents are not right at the rivers edge as they set back about 50 feet from the shore but most of the cabin tents have a view of the river. 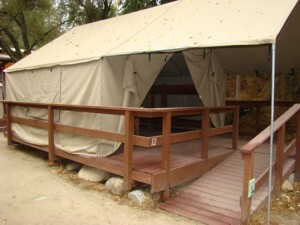 We have detailed descriptions of each tent below. 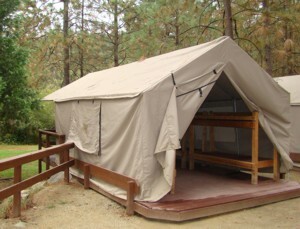 Our cabin tents are very popular so we suggest reserving them early to get the tent of your choice.